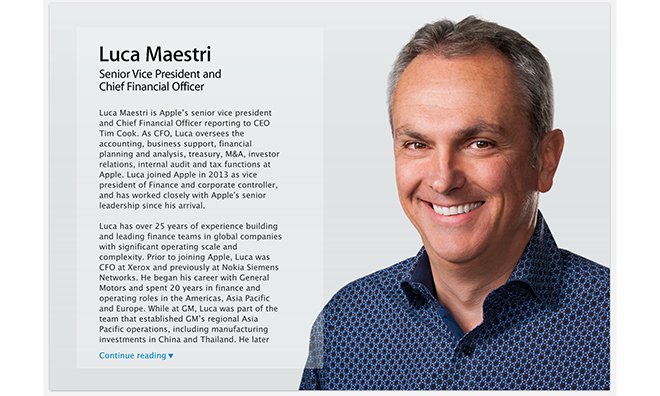 After being officially appointed as Apple's chief financial officer in an SEC filing last week, Luca Maestri's personal profile and corresponding headshot is now up on the company's executive leadership webpage. The addition of Maestri to Apple's leadership roster comes three days after a filing with the U.S. Securities and Exchange Commission officially confirmed the new CFO's position last Friday. The profile was uploaded in a change to Apple's website on Monday. According to his profile, Maestri will report directly to CEO Tim Cook on issues related to "accounting, business support, financial planning and analysis, treasury, mergers and acquisitions, investor relations, internal audit and tax functions." As Apple notes, Maestri will continue to serve as the company's principal accounting officer alongside his new duties as CFO. Luca has over 25 years of experience building and leading finance teams in global companies with significant operating scale and complexity. Prior to joining Apple, Luca was CFO at Xerox and previously at Nokia Siemens Networks. He began his career with General Motors and spent 20 years in finance and operating roles in the Americas, Asia Pacific and Europe. While at GM, Luca was part of the team that established GM's regional Asia Pacific operations, including manufacturing investments in China and Thailand. He later became CFO for all of GM's operations in Europe, which spanned over 45 countries with annual net revenue of approximately $40 billion. The SVP and CFO joined Apple as vice president of Finance and corporate controller in 2013. With his new duties, Maestri takes the reins from Apple CFO Peter Oppenheimer, who is expected to stay on until the transition period is completed sometime in September. In a separate SEC document last week, it was revealed that Maestri is to be paid an annual salary of $1 million and is now eligible for Apple's performance-based cash bonus program. In addition, the company's board of directors awarded the CFO 6,337 restricted stock units currently worth some $4 million. Maestri's new role was first reported in March when Apple announced Oppenheimer's departure.